MAYOR GERARDO V. CALDERON was born under the zodiac sign of Leo. He was born to a loving couple, Mr. Enrique Carvajal Calderon (deceased) of Aparri, Cagayan and Mrs. Salome Villamarin Calderon, who was a native of Angono, Rizal. Married to Ms. Carminda Esguerra Calderon and blessed with one beautiful, healthy and loving daughter named Jerimae Esguerra Calderon. "Gerry", a moniker tagged by his compatriots, studied and completed his elementary education at the Angono Elementary School in 1974. He finished his secondary education at Angono Private High School in 1978. Gerry took his chance of studying college in Manila ar Far Eastern University with a course of A.B. Mass Communication and graduated 1984. He also took up and finished short courses like Community Organizing Process at the Institute of Social Work and Community Development (University of the Philippines) in 1987, Development Management Program at Asian Institute of Management (Ifugao Lodge, Camp John Hay, Baguio City) in 1996 and Leading Collaborative Action of Societal Change, A Course on Bridging Leadership at Asian Institute of Management in May 2, 2003. 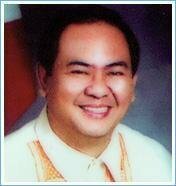 In 1987 to 1989, Mayor Calderon invest in a hog raising business and was been a Circulation Manger of Rizal Tribune. At the same time, he owned and managed the August Commercial Printing and in 1995 to 1998, the Saint Clement Enterprises, all located at Angono, Rizal. He developed his strength of character and discipline as he independently managed and lived his lives, even at his younger years. His father, who was a great disciplinarian and with a great sense for what is true and best, greatly influenced him during his formative years.